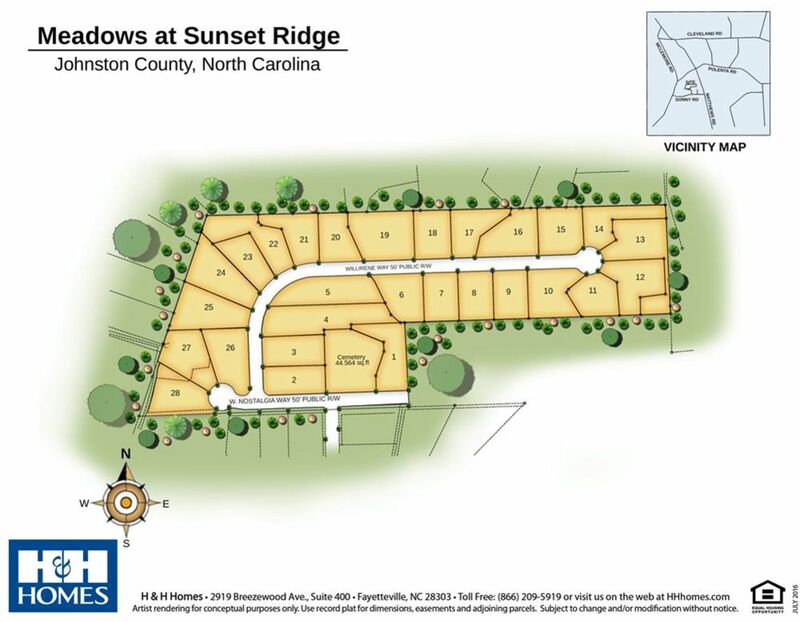 H&H Homes is now building new homes in Meadows at Sunset Ridge in Clayton, NC. Homeowners get a country feel without being too far from anything you need in this small, close-knit community offering homeowners spacious .5-1 acre homesites and 3rd CAR GARAGES ARE STANDARD ON EVERY HOME. Think of the storage! There will only be 28 homesites available, so don’t wait! Meadows at Sunset Ridge has easy access to all major highways, including Interstate 40 and 95, and the new 70 bypass. The White Oak Shopping Center is just 12 miles away featuring: Target, TJ Maxx, Best Buy, Michaels, and a variety of dining options! From Meadows at Sunset Ridge it is only a short 35 minutes to downtown Raleigh and RDU Airport, and 40 minutes to RTP (Research Triangle Park). Choose from 10 plans, each with dozens of options to make your new home uniquely you! H&H Homes is committed to ensuring this high standard, by applying its quality-assurance program to each home it constructs, which begins well before actual construction begins. This conscientious mindset extends throughout every step of the building process, and each home undergoes multiple exhaustive third-party inspections to ensure that the new home construction conforms to the highest industry standards. Take I-40 East and take exit 312 HWY 42 Towards Clayton/Fuquay Varina. Turn right onto HWY 42. Turn Left onto Clevland Road. Then take a right onto McLemore Road. Continue onto Raleigh Rd. Turn left onto Sonny Road. Then left onto Ocean Drive and a right onto Seashore Point. You have arrived at Meadows at Sunset Ridge.